#NOWSEETHIS is a celebration of the Hillman Photography Initiative co-produced by VIA and the Carnegie Museum of Art. The event took place Saturday, May 9, 2015 and featured musical performances, interactive art installations, and live visuals. The concept and content for the live visuals explore uses of 3D modeling and game engine software in a site-specific context. 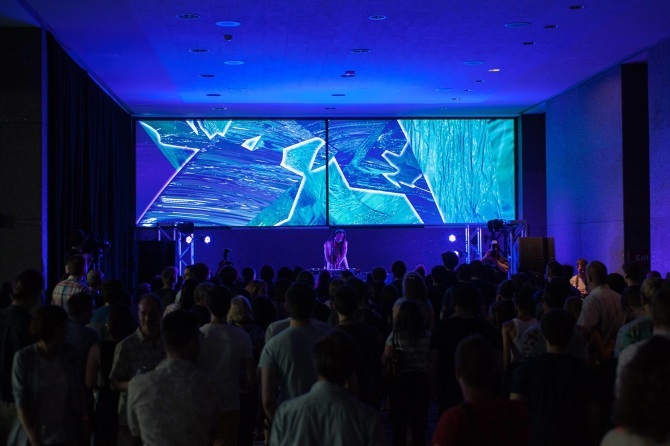 A video camera captures a live feed of a stage performance–in this case, a DJ set by the musician and artist Juliana Huxtable. This live camera feed is projected above the stage. This same live image is simultaneously fed into a computer running the Unity game engine. Within Unity, the live feed is textured onto surfaces and objects in a virtual environment that mirrors the physical environment inhabited by the audience. A user then navigates this virtual environment, and their journey through the virtual space is projected alongside the unprocessed live camera feed above the stage. This structure allows viewers to consume a single live event through multiple perspectives and various levels of mediation. Presenting these different perspectives alongside each other demonstrates the ways in which images are constructed for an audience, and asks us to consider how an audience relates to a live performer and their live image in both physical and virtual space. #NOWSEETHIS uses contemporary technology to explore longstanding questions about the dynamics between audience, performer, and image. It combines the various disciplines of media design, video production, creative coding, 3D modeling, and game creation in the context of live performance. #NOWSEETHIS was created with support from a microgrant from the Frank-Ratchye Fund for Art @ the Frontier (FRFAF) — an endowment founded to encourage the creation of innovative artworks by the faculty, students and staff of Carnegie Mellon University. With this fund, the STUDIO seeks to develop a cache of groundbreaking projects created at CMU — works that can be described as “thinking at the edges” of the intersection of disciplines.